Saturday 8 November at Hexham Auction Mart from 10 a.m. to 4 p.m. The word Qigong (Chi Kung) is made up of two Chinese words. Qi is pronounced “chee” and is usually translated to mean the life force or vital-energy that flows through all things in the universe. The second word, Gong, pronounced “gung”, means accomplishment, or skill that is cultivated through steady practice. Together, Qigong (Chi Kung) means cultivating energy, it is a system practiced for health maintenance, healing and increasing vitality. 11.a.m.- 12 noon Main Hall –Talk by Edwin Courtenay. Edwin Courtenay is a spiritual teacher, clairvoyant, channel and healer, psychic artist and sound healer – he is the author of three books published in three languages and teaches regularly at the college of Psychic Studies in London. www.edwincourtenay.co.uk. I draw inspiration for my sound and colour meditations from Andean traditions based on personal spiritual experience of working with Don Americo Yabar over the last 10 years and my ongoing training with Tama-Do, The Academy of Sound, Colour and Movement. “The story of the Universe is written in the Rainbow Colours of the Sky and imprinted in our DNA. “Everything we know comes from the Light. We are just star light. And because we are Divine in nature, we are just beginning to remember..” Fabien Maman. Come along and experience the energy and beauty of connecting with Cosmic Love Peruvian Style and Tama-Do Rainbow Colour Silks Meditation to help bring wonder and light into each moment for you. Experience Nia. A holistic, mindful form of movement that leaves you feeling centred and energised. Danced to inspiring, uplifting music that all ages can enjoy. Do you have a pack of Tarot cards but never done anything with them? Are you drawn to the Tarot but don’t understand why? Or are you a budding reader keen to make a start? If you answer YES to any of these, then come along and find the answers. This talk is an open forum for the curious, the keen, and the (maybe) nervous. So let’s make a start by looking at the basic concepts of this fascinating tool. Trudy will have several decks in use for demonstration purposes at this talk. What’s in store for you? Sound is a powerful source of healing capable of rebalancing, rejuvenating and healing the physical body, mind, heart and spirit. Used since the beginning of days, it has played a part in every civilization of the world tending to the holistic needs of the people and helping to unite them with their own magick and the greater Divine. Edwin Courtenay uses his voice in combination with the pure tones of Crystal Singing Bowls, the rhythmic power of the Shamanic Drum, Koshi Bells, the Silver Branch, the Sansula, tongue Drums and the Native American Flute to tend holistically to the individual’s need, guided by Spirit to create a bespoke sound healing journey. In this lecture Edwin will not only demonstrate this array of powerful instruments but also explain how each one affects the different fields of energy, chakras and holistic states and how we can “self medicate” with sound by following a few simple guide lines and rules. This promises to be a powerful, interactive lecture complete with a sound journey meditation perfect for relaxing too and receiving a balanced healing – just what the sound doctor ordered! Saturday 8 November from 10 a.m. to 4 p.m. at Hexham Auction Mart, Tyne Green, Hexham, NE46 3 SG. Pat Smith, psychic artist and jewellery hand made by Pat’s students at First Step. Psychic art is intuitive drawing based on connecting to a person’s energies. Bob Carr – tarot reader and healer. Caroline Taylor, Candle Love. – handmade candles. Sue Knight – angels, incense, crystals and salt lamps. Debbie Young – kinesiology and crystal healer. Crystals, candles and natural salts. 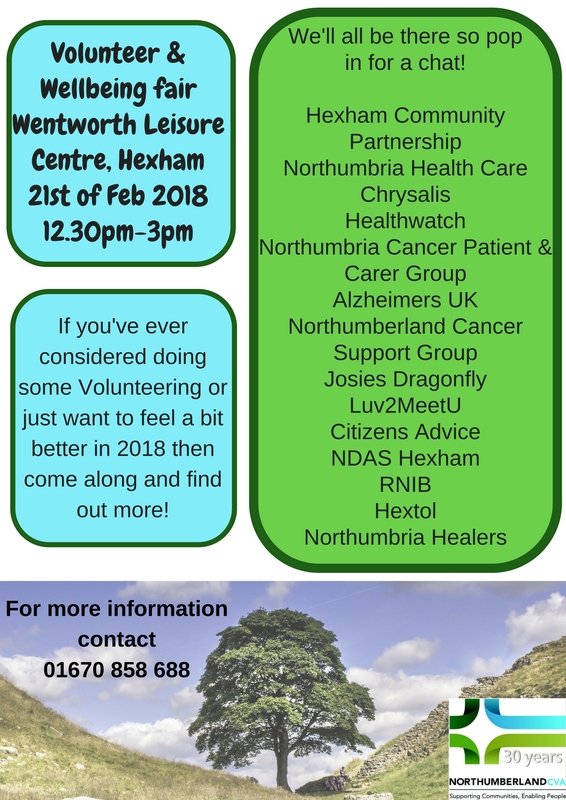 Northumbria Healers – free healing sessions. Donations accepted. 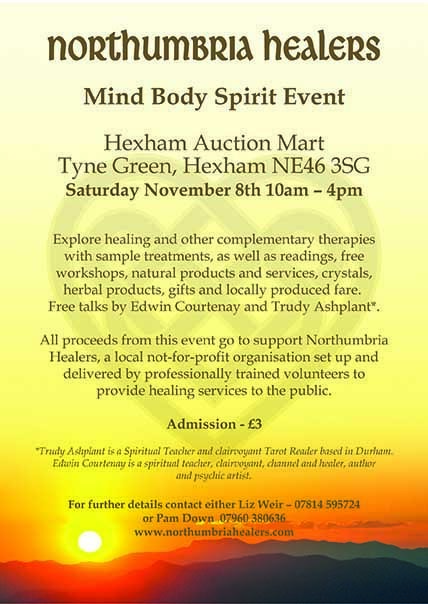 Our Mind, Body, Spirit event will take place on Saturday 8 November from 10 a.m. to 4 p.m. in the Auction Mart at Hexham. There will be a range of goods and products on sale and psychics will be available for readings. The admission fee of £3 gives access to free talks and workshops and Northumbria Healers will be giving healing, also at no extra charge. We hope that you can come and look forward to seeing you there! For more information or to reserve a table, please contact Liz Weir (0781 4595724) or Pam Down (07960 380636). Would friends please note that the Healing Centre on Saturday 31st May will now be in the Parish Hall, Millfield Road, Riding Mill and not the Millennium Hall as previously notified. We will be open from 2pm to 4pm as usual and hope to see you there. Unfortunately the premises at St Andrew’s Church, Benton are no longer available to us. However we intend to look for other premises in the Newcastle area and will keep you informed via this website. Due to the success of the Healing Centre at St Andrew’s Church, Benton on 6th May, we are pleased to announce that we will be holding monthly Healing Centres at this same location over the summer months. The next Healing Centre at St Andrew’s will be on Tuesday 3rd June from 5pm to 7pm. Please see the Events page for details of the address. We will be running a one-off Healing Centre in the Liddell Hall, St Andrew’s Church, Station Road, Benton, NE12 8AW from 5pm to 7pm on Tuesday 6th May. Healing is by donation – all are welcome. We are pleased to tell you that the April Healing Centre will run after all. It will be on Saturday 26 April from 2 p.m. to 4 p.m. in the Parish Hall, Millfield Road, Riding Mill, NE44 6DJ. We look forward to seeing you there! Would friends please note that the Healing Centre will be at the Millennium Hall, Church Lane, Riding Mill, Northumberland, NE44 6DR in March 2014 and not in the Parish Hall, Riding Mill as previously notified. Apologies for any inconvenience that this may have caused and we very much hope to see you there.